Mortgage inquiries rose in 1.5 per cent in the first quarter of 2012, compared to the first quarter of 2011, according to Veda’s Consumer Credit Demand Index. They ticked up 0.2 per cent from the fourth quarter of 2011 to the first quarter of 2012. “Turning points in mortgage inquiries usually occur one to three quarters ahead of turning points in house prices, an early warning sign which could indicate that after a continued decline, mortgage inquiries may have bottomed out,” said Angus Luffman head of consumer risk at credit data company Veda. Mr Luffman said mortgage inquires are “closely related” to the number of housing finance approvals. A combination of interest rate uncertainty, worries about the global economy and the pervasive lack of affordability has helped lower capital city home values by 4.4 per cent in the year to March according to RP Data. Home prices rose 0.2 per cent in March following two official rate cuts at the end of 2011. Despite the hopeful sign on mortgage inquiries, other readings on the property market suggest that headwinds remain. 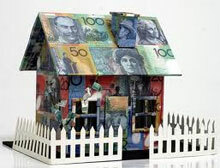 Official Australian Bureau of Statistics data showed that after the number of seasonally adjusted owner-occupied loans rose for nine months ending December 2011, they began to fall again in the new year, dropping by 2.5 per cent in February. While Australia has avoided the sharp house price falls seen in other Western economies during the financial crisis, households have spurned borrowing in favour of paying down debt. These factors have slowed the housing construction sector to a crawl in some areas. Veda said overall consumer credit dropped by 4.8 per cent in the year to March, while credit card applications sank by 8 per cent in the same period. Personal loans applications also slipped by 1.4 per cent in the year to March. Total household debt, which peaked at 154.4 per cent of household disposable income in the middle of 2010, has slowly fallen under 150 per cent of household disposable income, he said. Even through troubles remain for the housing market, Mr Circosta said economic fundamentals still remain supportive for rising home prices if further Reserve Bank cuts are passed along to consumers. The RBA is widely expected to lower the official interest rate to 4 per cent on May 1, although whether or not banks pass the cuts on in full remains an open question. Mr Circosta also noted that auction clearance rates have begun to turn up lately, which often coincides with rising house prices. Melbourne’s auction clearance rate rose to 59 per cent last weekend in Melbourne from 54 per cent the weekend before, according to the Real Estate Institute of Victoria. In Sydney, they were 59 per cent up from 55.5 per cent, according to Fairfax-owned Australian Property Monitors.